ABORG has had the pleasure of assisting Joule with their email broadcasts to Canadian physicians over the past 9 years. Joule is the Canadian Medical Association’s (CMA’s) subsidiary designed to assist physicians in the pursuit of clinical excellence. 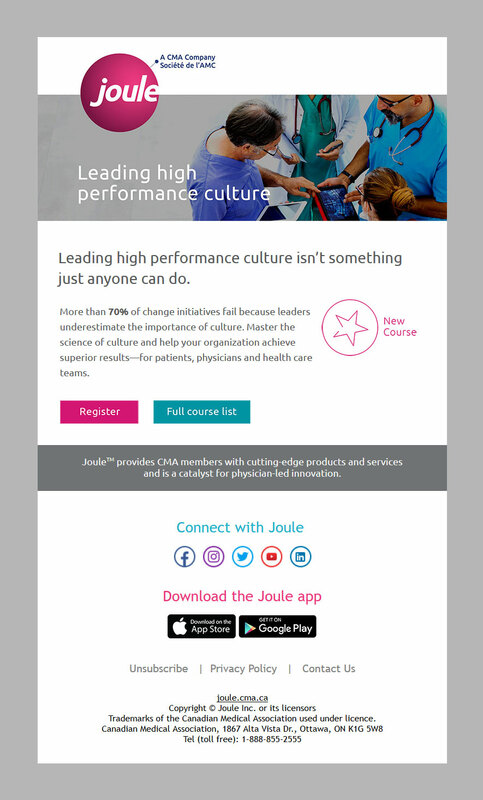 We’re happy to help Joule reach their physician members through email broadcasts with valuable continuing education opportunities, evidence-based clinical products and research, and exclusive offers from physician entrepreneurs who are pushing the boundaries of technology in health care to allow Joule members to ensure their practice is at the forefront of modern science and medicine. ABORG develops the creative and HTML design of the Joule newsletters and takes care of all the logistics involved in the distribution itself including advanced list sorting and grouping, streaming of the broadcast, and tracking measures to record open and click-through-rates.